He’s right. Songs are everything. And The Dives have them. Examine the band’s debut EP Everybody’s Talkin’ for evidence and there’s plenty, as the melodies tumble and trigger thoughts of everyone from The Who and The Kinks to Elvis Costello, Squeeze and Big Star. The band clearly know their way around a melody. And that’s not all. When you ask Stanley about other New York bands worth keeping an eye on, he tells you to re-focus, saying, “for now, let’s keep all the eyes on us,” and you realise he might just have the personality to carry this off as well as the songwriting chops. Perhaps that’s not surprising, because Evan Stanley’s dad is the Starchild himself, Kiss legend Paul Stanley. Personality runs in the blood. The Dives are currently supporting Kiss on their European tour, and have a headline show booked at London’s Water Rats on May 29. 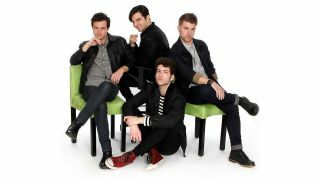 Classic Rock caught up with Evan and the rest of the band — guitarist Mike Lefton, drummer Jimmy Meier and bass player Sergio Ortega — and asked them to tell us how they got together. Mike: We all knew a guy and he thought we should meet. We did and it clicked. All of us loved hanging and playing and we couldn’t stop. We all have the same passion and the same goals, so it just worked. Evan: We’re not concerned with chasing trends. We make the music we love and that we wish we heard more of. There are no gimmicks, no backing tracks, no backup dancers. It’s just us. What you see is what you get: loud guitars and catchy songs. Jimmy: Yeah, bands these days seem to spend so much time on everything, but rehearsing their songs. With all the technology available, it’s too easy to rely on editing things to get the sound you want instead of putting in the time practicing. We are constantly trying to outdo our recordings live and make each show better than the last. Evan: I’m lucky in that growing up I was exposed to such a wide range of stuff and all of that creeps into what I do, but at the end of the day, for me, it really comes down to The Beatles, The Who, Led Zeppelin, and Tom Petty & The Heartbreakers. Those are the four essential food groups. They each have their own identifiable balance of power, nuance, and songs that endure. The musicianship in each of those bands is off the charts and they always used that ability to serve the song. Jimmy: I was brought up on country music. It wasn’t until I was about 15 years old that I started branching out and developing my own musical taste. I was always drawn toward bands with great songs. The Beatles, Tom Petty & The Heartbreakers, and The Eagles were basically the soundtrack of my teenage years. I think I gravitate towards bands whose drummers play for the song, not just to show off. I would like to think that shows up in my playing. You’ll no doubt face criticism from people who say you have an unfair advantage because of your relationship to Paul Stanley, and that you’ll benefit from opportunities not offered to others. How do you respond to that? Evan: Yes, there are opportunities afforded to us that aren’t readily available to other bands, but even if a door is opened for us, that door can easily be slammed on our foot. It’s happened to many in my position. How many kids of people in the spotlight have failed? Ultimately, the public decides what’s worthy. My dad’s fame isn’t a free pass for me. Like everyone else, I have to prove myself. For some I start with an advantage. For others I start with a big disadvantage. Sergio: Extra opportunities or not, this is a lot of hard work. Every opportunity is a challenge because we’re under a microscope. In order for this to be something sustainable, it’s a 24⁄7 commitment. Are Kiss an influence? And, if so, how? Evan: I have the utmost respect for what my dad does. I couldn’t be more proud of him and I’ve learned a lot from the band’s determination and work ethic. That being said, I can’t really say that Kiss is a musical influence. If you walked into my room when I was growing up and I wasn’t blasting one of my four essentials, I’d probably be listening to The Byrds or Elvis Costello. Jimmy: I didn’t grow up listening to Kiss, but it’s nearly impossible not to be aware of them. The quality of their live shows and their reach is something every band strives for. We certainly want The Dives to be as ubiquitous as they are one day. Mike: I always remember seeing a few Kiss albums in my dad’s record collection, but my taste has always been more geared towards bands like The Beatles, The Who, and Badfinger. Having said that, you still have to be amazed by the power, stage presence, and longevity of Kiss. That’s something we all hope for. What would you tell Kiss fans to make sure they arrive in time to see your support slots? Mike: We need you there, we want you there, and we won’t let you down. Where will The Dives be in five years time? Sergio: I think we’ll be very easy to find. The Dives EP Everybody’s Talkin’ is available from iTunes now. Tickets for all dates are available from Ticketmaster.